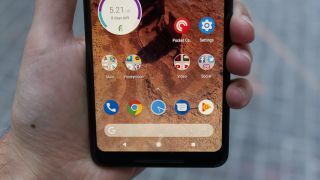 Reports of Google Pixel 2 XL screen burn-in problems are beginning to mount, less than a week after the new Android Oreo smartphone went on sale. Screen burn-in occurs when the same image stays on the display long enough and a ghost image remains, even when moving to another screen. That seems to be what's happening on one of our Pixel 2 XL phones and those of other reviewers who have had the device in hand for about two weeks. Where will you notice this alleged burn-in effect first? The notification shade, status bar and on-screen navigation buttons, according to the first people to spot the burn-in issue at at Android Central. This could be a case of screen burn-in on the new LG-made Quad HD+ POLED displays and while faint right now, it could lead to further problems down the line. Or it could be something called image retention – a more temporary problem that goes away eventually. "The Pixel 2 XL screen has been designed with an advanced POLED technology, including QHD+ resolution, wide color gamut, and high contrast ratio for natural and beautiful colors and renderings. We put all of our products through extensive quality testing before launch and in the manufacturing of every unit. We are actively investigating this report." The Pixel XL 2 screen burn-in issue is a new phenomenon that surfaced today, and it's different from the muted colors seen on the same phone last week. Neither of the dueling display problems have proven serious – yet. Our review notes the less-than-perfect screen, but calls the Pixel 2 XL a fantastic phone for its best-in-class camera and trendy all-screen design. That remains unchanged. Of course, if the display is of supreme importance to you, you might as well go with a Samsung Galaxy Note 8 or a S8 Plus. Both phones feature slightly bigger, true-edge-to-edge curved screens and the best Mobile HDR+ displays around.